OK…so we have all be subjected to the ESPN assault on our program (we are not alone, they are running down any Big East teams they can) and see that the nation believes – in droves – that Louisiana Lafayatte is going to walk the dog on us in front of what will undoubtedly be a home field advantage at the Super Dome tomorrow. Should the Ragin’ Cajuns be the favorite in this game? Abosolutely. 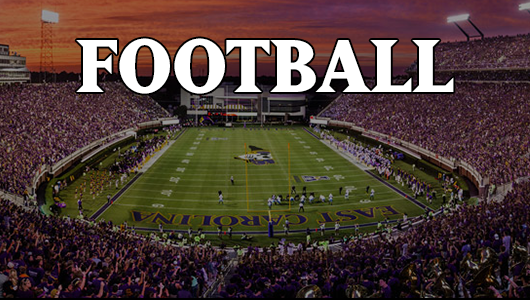 Should ECU fans understand that our 8-4 really does not look as good as other 8-4 teams? Without a doubt. Can this team – our Pirates – win this game? Yes, and the program needs it now more than ever. Look, we have been on an extended slump. The two Liberty Bowl losses under Skip and the loss in D.C. two years ago have us squarely on a post-season losing streak and frankly, having not beat a team with a winning record and having our four losses be so pronounced to – frankly – mediocre teams (save USC), it is easy to see why no one thinks we can win. BUT…we have been here before. Last time, it was everyone’s favorite Boise State Broncos who were supposed to win without a fight and we all remember how that one turned out. Suffice to say, we lead the all-time series with the king of the have nots, not them. But, we desperately need a win to legitimize this season. If we lose to the Ragin’ Cajuns, then our 8-5 might as well be 5-8. If we beat them, well then hello daddy…we are a win away from 10 wins, bringing back an overwhelming number of starters into – most likely – the new league in 2013 (expecting all teams to move quickly). We must, must, must – did I mention that it is really important that we – win. This program needs it and to get that win, will provide more momentum within the program than you would expect. It will fuel a recruiting bump up and sets us up for a short climb next year (as we would be able to garner some pre-season recognition heading into the 2013 season). Can we, though? Can we beat this virtual doppelganger in Louisiana Lafayette? The short answer is yes, but it will take a mammoth undertaken and here is why. Our defense. Our offense no doubt has found its sea legs, offering the ability to drive the field with a defense on its heels guessing what we will run next or the ability to strike quick over the top to the likes of Reese Wiggns and Jabril Solomon, in the intermediate zones to big man Justin Hardy or YAC master Justin Hardy (who should be an AA candidate this year if not next), or strike in the air or ground with the COOOOOOOP. But our defense. Oh, our lovable, talented (for reals not toungue and cheek) but all too often inept defense. Look, I am of the opinion that we have some serious talent on our defense. But, we have some serious gaps and, I hate to say it, but we have X and O problems at times back there. Like trying to have our safeties cover pitch men against Navy or having our corners not play tight, not play loose, not play – seemingly – any scheme known to the college football world. Our linebackers can shut down pretty much any running team in America, but also, 12 games in, cannot seem to find ANYONE in their zones during pass coverage. Back to the match-up. Which defense has the best chance of getting more stops? ON paper…not ours. And, as good as our offense has been down the stretch, it is not able to be 100% perfect and our defense has shown that it can go virtually and entire game without a stop. So, the pundits – ESPN’s agenda driven drivel aside – are probably correct in picking the Ragin’ Cajuns. That said, hope runs eternal in Pirate Land, so I am thinking that our defensive coaches sense that there jobs are in the balance and our players can execute a game plan…perhaps this is the game it comes together. I have said in the past that we all will know whether or not we are in the game on the very first offensive and defensive drive of each half. Our team tips its hat instantly and in this game, we desperately need a fast start in this game to have a chance. Not because LL is that good, but because our defense is that unreliable and plays much better when the pressure is on the O. With confidence and a lead, our D has shown a way to hold on or get a stop. But, if the D has to dictate the game, we are in trouble. There are some bowl week signs that our players are jacked up and looking to prove something. That there is a chip building. Good…because we need that attitude. A win…and 2013 looks like a boon. A loss, we may need to reevaluate our program. For the Seniors…here’s to a great finish to your careers. Love to hear thoughts on this matchup, the importance of this game, and the program’s direction.